Stripping pads remove all finish, sealer and contaminants from the floor surface. Use with water based, floor finish stripping solutions to remove old, soiled floor finishes and sealers at the start of a maintenance program and at times when scrubbing will not achieve the desired result. The Black Stripper Pad 7200 is also used to clean heavily soiled, hard surface floors, such as concrete, with appropriate cleaning chemicals. 20 diameter pads are designed for use in rotary or automatic equipment on low speeds from 175 to 600 RPM. 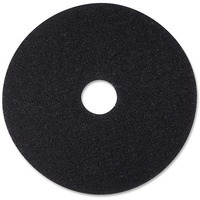 Stripping pads quickly and thoroughly remove old finish, dirt and buildup. Each pad is made of nylon and polyester fibers in an open textured nonwoven construction. Abrasive particles are dispersed throughout and bonded to the nonwoven construction with a durable adhesive.